Pretty pictures… and something a little more. War Horse, set during World War I with a horse as a main character and Albert (Jeremy Irvine) as his teen owner who must let him go to service for the cavalry, is an understatement to say just pretty. It is magnificently photographed, with rich hues of green and browns, contrasting with skies of blue or smokes of grays. The natural windswept feel of the old English landscape is splendid, and even the simplest details of equine plowing shares a vivid illustration. Going in, you know the film is two and a half hours and focuses on a horse. Only Steven Spielberg (“A.I.,” “Saving Private Ryan”) could have directed this movie and held your attention for that stretch of time. 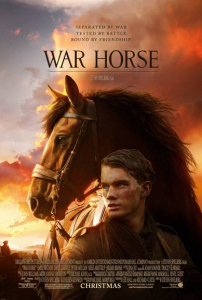 The horse’s name is Joey, who transfers involuntarily from use of British to German soldiers, is adopted by French farmers, is captured once again for use of military duty, is unleashed and runs wild only to fall into No Man’s Land caught between sides. During this time we observe all the tides of those men and women stuck as unwanted participants in war. Albert’s drunken father (Peter Mullan) wins the horse at an auction, but when it’s acknowledged that Joey is not a farming horse, the family is in danger of losing everything (Emily Watson is the resentful mum). They need an animal that plows, and gosh darn it if the kid isn’t going to be the one that trains him. Joey, whom with stronger legs than that of your usual colt, indeed becomes a successful plowing horse. But when World War I breaks out in 1914, all lives forever change, and Joey ends up in the service. Albert though is too young to qualify for the draft. But when he comes of age, he goes to war in hope to find his horse. He hopes to do this by finding the British soldier who took Joey. Joey is a character, at least for the younger pre-teens in the audience. 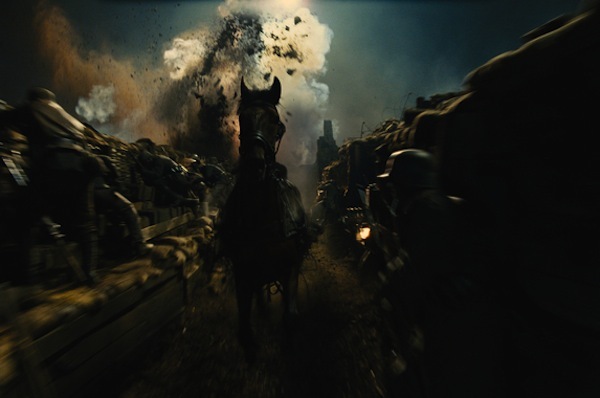 But “War Horse” also works, if not immediately but over time, for a theoretical highbrow adult audience that sees the horse as a symbolic beacon. Spielberg is just as interested in how certain officers are willing to sacrifice the horse for grueling functions while others see the horse as a thinking mammal. Can a horse feel so much as love and compassion, or sadness and regret? Can a horse feel such frustration as to run wild through barb wire in a ravaged battlefield? Can a world that cruel in wartime still find time to call truce between German and British enemies when it comes to the welfare of a horse? It must be said that the wartime violence is as subdued as it possibly can for sake of the family audiences that will attend. There is one outstanding war scene of French soldiers charging from their trenches into a battlefield that provokes mortar and artillery fire from Germans stationed in machine gun pill boxes, and plenty of bodies fatally plop. The sequence takes inspiration from Stanley Kubrick’s “Paths of Glory” (1957), a self-professed favorite film of Spielberg’s, with replicating camera compositions. If the blood is subdued, no matter, the war horror still sears the senses. The long-running Spielbergian theme of family reunion and homecoming is prescient. But Joey has been taken by so many hands in the film that ownership and bond take questionable connotation. Saved for last are some of the most gorgeous artificial backdrops in movie history, images that certainly recall those blood red skies used on the prairie in “Gone With the Wind” (1939). The sensation it evokes is preciousness and sentimentality, but if you have an open heart, the film has earned it. Film Cousins: “The Black Stallion” (1979); “E.T. : The Extra Terrestrial” (1982); “Black Beauty” (1994); “Spirit: Stallion of the Cimarron” (2002).